Ajax defender Matthijs de Ligt sparked a comeback for Holland this evening when he scored a wonderful header against Germany. 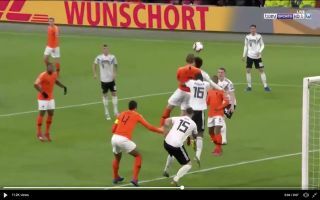 Just after the sides returned from halftime, Holland won a dangerous free-kick in the 47th minute, former Manchester United attacker Memphis Depay whipped in a lovely cross and De Ligt leapt above not one but two Germany defenders. De Ligt showed his amazing battling instinct when he beat Thilo Kehrer and Chelsea centre-back Antonio Rudiger in the air to score a lovely header which came off the back of his head. According to Mirror Football, Barcelona have first refusal on any of Ajax’s promising young stars since they secured the signing of Frenkie de Jong, it’s also understood that the two clubs considering an affiliation – this wouldn’t come as much of a surprise given the number of stars who have switched Amsterdam for Barcelona in the past. The towering header was also De Ligt’s first international goal, this could be a memorable night for the youngster.